October 8, 2018 By Allyson 15 Comments This post may contain affiliate links. Read my disclosure policy. 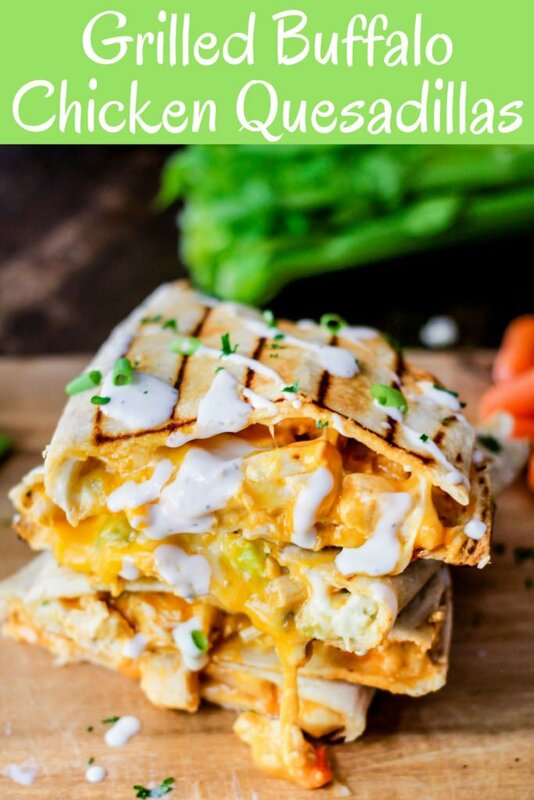 Classic buffalo chicken flavors mixed together and grilled between two crunchy tortillas makes the perfect Grilled Buffalo Chicken Quesadillas. 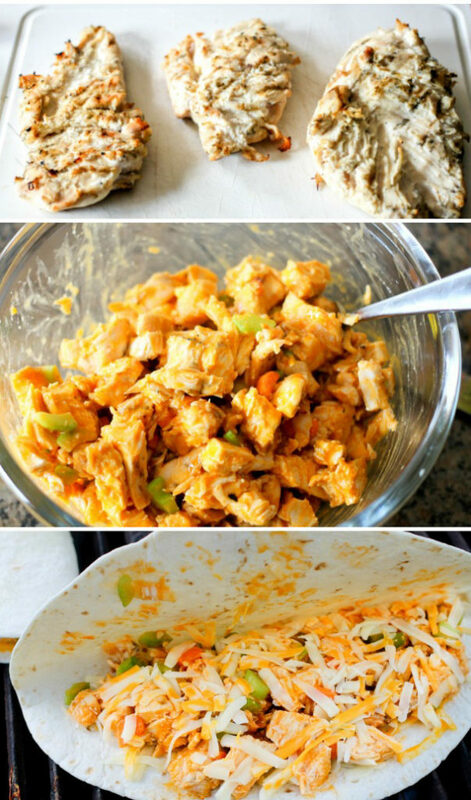 If you follow Domestic Superhero then you know that I am obsessed with all things buffalo chicken. I mean, how can you not be?! Buffalo sauce is essentially delicious on ANYTHING, so I pretty much can guarantee that if you add it to a dish, the dish will turn out super tasty! 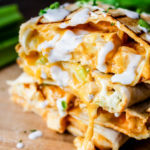 Using the classic flavors of a buffalo chicken wing, I paired them together and made these amazingly tasty Grilled Buffalo Chicken Quesadillas. Today’s post is sponsored by Traeger Grills, but as always all my opinions are my own. I have been loving my Traeger grill for things just like this! While Traeger grills are mostly used for smoking (although you can really do ANYTHING on it), I love grilling on it as well. It’s consistent and gets the job done FAST! 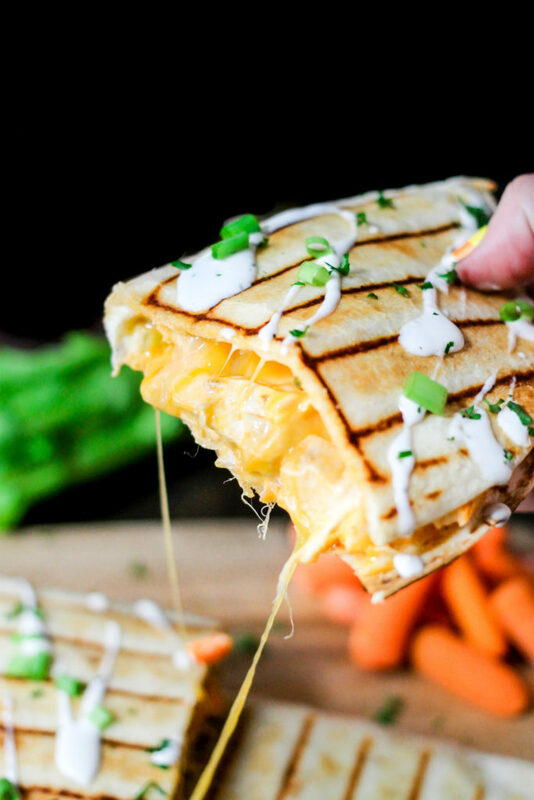 Now, I love using a grill to make these buffalo chicken quesadillas, but you can always use a grill pan as well. 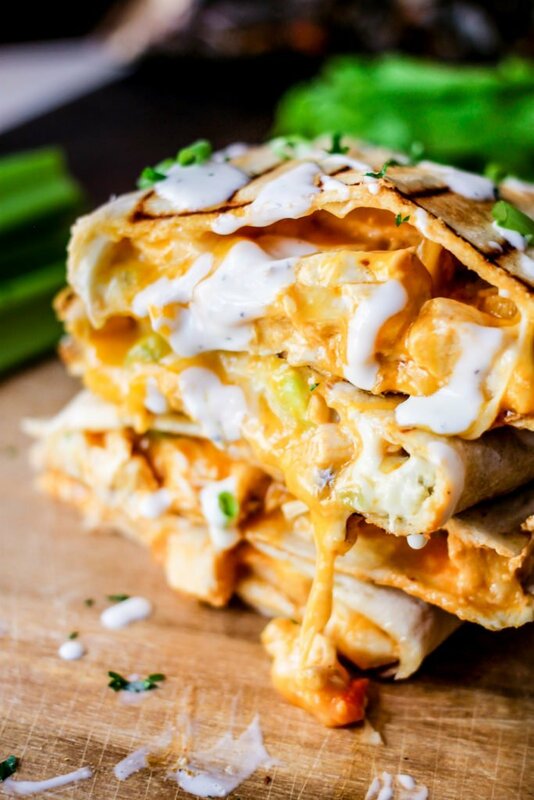 There’re only a handful of ingredients, but the cheeses, carrots, celery, and sauce really make these Buffalo Chicken Quesadillas POP! Get all the ingredients together; chicken, cheeses, celery, sauce, carrots, spices, and tortillas (scroll down for amounts). Grill the chicken until cooked all the way through. Then add to a bowl with the celery, carrots, sauce, spices, and some of the cheese – then mix it all together. Using 3 chicken breasts allowed me to make 3 massive buffalo chicken quesadillas, so you could probably even spread it to 4 whole quesadillas if you use less filling in each one. Add the filling to a large flour tortilla, and then brush the sides that will be grilled with a little oil. Pop these back on the grill in order to melt the cheese! Flip them over after a few minutes and then serve them! I like to close the grill to make the cheese melt more quickly, but be careful not to burn the quesadillas. Top with ranch (Jalapeno ranch for the win)or blue cheese dressing and chives (or more buffalo sauce if you like it HOT) and then devour! VERSATILITY: GRILL, SMOKE, BAKE, ROAST, BRAISE & BBQ: Traeger 6-in-1 versatility allows you to cook hot and fast or low and slow. When you fire up your Traeger, you ignite the power to grill, smoke, bake, roast, braise, and BBQ – From baby back ribs to wood-fired pizza, smoky mac & cheese and even homemade apple pie, you can cook up pretty much anything on your Traeger. EASE: WOOD FIRED COOKING IS SIMPLE WITH TRAEGER: Traeger’s ease of use and simple controls let you focus on what matters: your food, your family, and your friends. The digitally controlled convection heating system simplifies wood-fired cooking, allowing for easy temperature settings, just like your oven. So whether you’re perfecting a recipe or watching the game, Traeger has you covered. CONSISTENCY: PERFECT RESULTS WITH EVERY SINGLE COOKConsistent temperature gives consistent results, meaning you can craft food rather than tend to the fire. 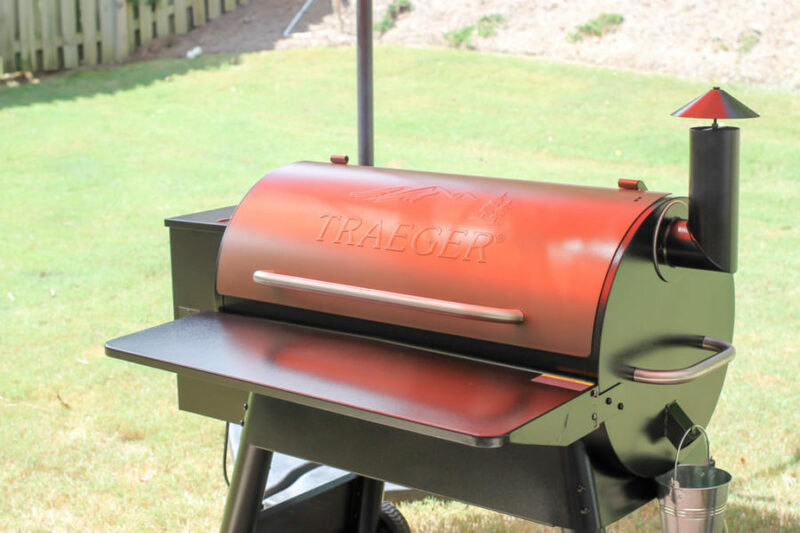 Traeger manages the temperature, cutting out a major variable in achieving consistent results. COMMUNITY: TRAEGER USERS BELIEVE IN BRINGING PEOPLE TOGETHER: Traeger users swap food and recipes, tips and tricks, victories and learning experiences. They are as passionate about food as they are about sharing it with friends and family. Traeger has your back with a new recipe each day and VIP customer service to help provide tips, tricks, and resources. Traeger is a community of sharing and inspiration, and they invite you to join us in the wood-fired revolution. I love quesadillas and sandwiches so much! See these other recipe ideas that you can also make on a Traegar grill! Jalapeno Ranch Black Bean Loaded Nachos are loaded with fresh ingredients and homemade spicy jalapeno ranch. In less than 20 minutes you have the perfect dish! Grilled Sausage Foil Packs are loaded with delicious Yuengling infused sausage, red potatoes, mini corn cobs, and onions! Perfect for a quick easy dinner! Heat the grill on medium/high. Spray grill top with nonstick spray or brush with oil. Sprinkle salt and pepper on the tops and bottoms of your chicken breasts. Place on grill and close. Cook 5-6 minutes per side, or until cooked through (times will vary depending on heat level). Remove. Using a fork and knife, chop chicken into bite sized pieces. In a large bowl, combine chicken, buffalo sauce, celery, carrots, colby jack cheese, and bleu cheese crumbles. With tortillas open, add mixture to half the tortilla spreading in an even layer. Fold the other half over the top and lightly press down to secure. Repeat for all tortillas. Brush olive oil over one side, and place that side DOWN on the grill. Brush the top side once set on the grill. Repeat for all. Cook 2-3 minutes per side*, or until lightly crisped and cheese is melted. Watch carefully so avoid burning. Remove and set aside. Cut quesadillas in half. Serve topped with parsley, green onions, and ranch. Enjoy! *I prefer to close the grill top to cook the inside of the quesadilla faster, however it will cook quickly so keep a close eye on it to prevent burning. Don't like bleu cheese? Leave it off! Oh man! 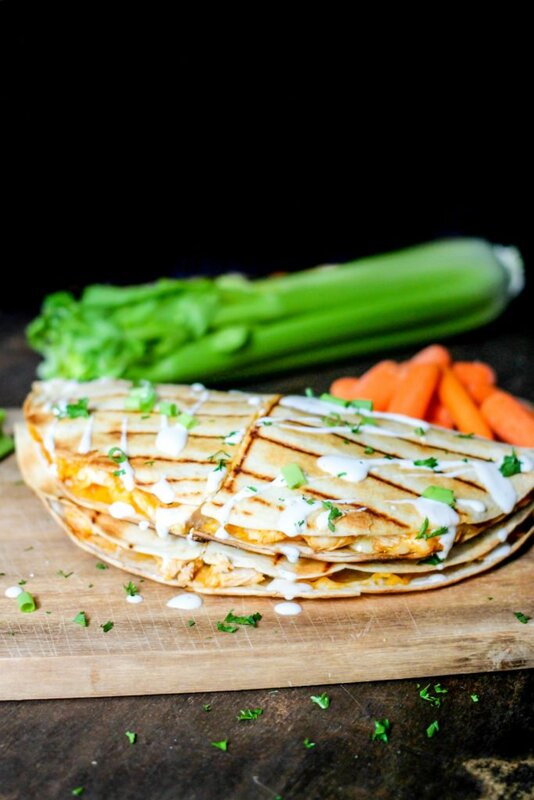 These quesadillas look PERFECT. I usually make quesadillas in a pan, but on the grill looks SO much better. Yum! My boys love all things spicy! Totally making these quesadillas! My stomach just growled looking at these pictures! I’m so hungry now and am running to the kitchen to make these!! I love all things Buffalo, too, so this has me drooling! Wow, do these look super delicious! Definitely a must make! I love those grill marks! I’ve never made a quesadilla on the grill – I have to try it! Oh it makes life SO much easier! We love the buffalo chicken dip. My kids are always asking for it. They are going to flip out when I make these!! They will definitely LOVE them! These quesadillas look so inviting! So yummy! Now I am hungry! I love how cheesy are they! Yum!! I need to try this out for lunch sometime soon!